Simulation of a light beam changing direction showing total internal reflection. The light source lies within an optically dense block. At the start of the animation, the light source points vertically upwards and light rays escape from the block vertically. As the light source rotates, and the angle of incidence increases, so the emerging (refracted) ray is progressively bent towards the horizontal. When the refracted ray would lie horizontally along the surface of the block (i.e. when the angle of refraction is 900) the angle of incidence is called the critical angle. Beyond the critical angle, light no longer escapes from the block but is totally internally reflected, and propagates along the block. This property of propagating within an optically dense medium is used in optical fibres. 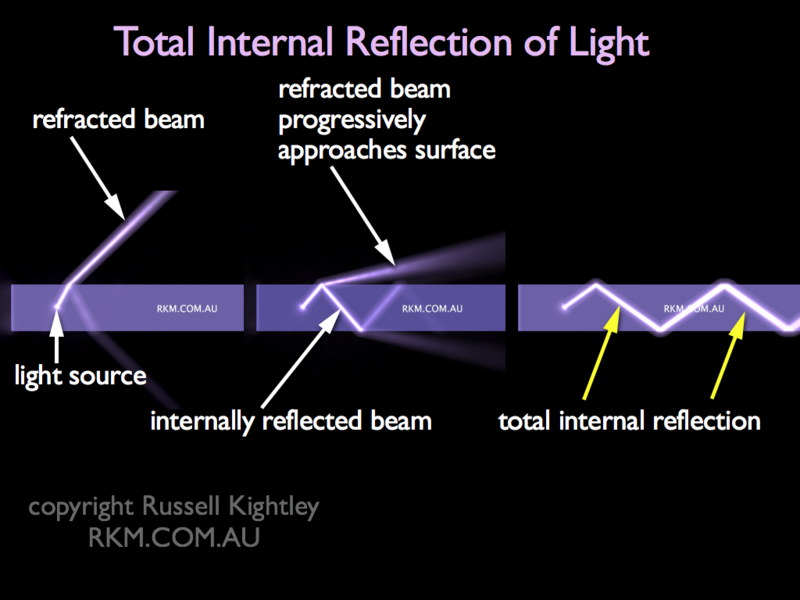 Note how some light is always internally reflected, even before the critical angle is reached. See our Critical Angle Calculator.